Looks like Nintendo threw in a nice homage to EarthBound in Animal Crossing New Leaf! He also mentioned Bobbery of Rogueport from Paper Mario, too, but this one did a better job catching my attention! Is this new game full of references like that? If so, that’s cool – and I wonder if any other EarthBound references have snuck in there! I noticed this when I played. One of my villagers was wearing the Ness shirt I made and was listing to Rockihn K.K. which is the hippie theme from Earthbound. I am 99% sure that it is in all the games though. The Animal Crossing series is a love letter to Nintendo fans of all sorts. They have a fortune cookie you can buy each day with play coins and win various Nintendo goodies such as a Baby Metroid that plays the opening theme to ‘Super Metroid’ a Mario coin, complete with sound, a Yoshi Egg that bounces and says “Yoshi!” and even the S. S. Dolphin from Pikmin. One of the villagers in the game even says “It’s on like Donkey Kong” so the series is jammed full of not just Earthbound references but Nintendo in generally especially in ‘New Leaf’. I lost count of Nintendo references after about 30 so far in my five days of playing it since Sunday, there is a LOT! I remember seeing Guliver saying fuzzy pickles and not thinking much about for some reason. And this is coming from someone who named their town Moonside and town tune is the beginning part of Smiles and Tears. This clearly confirms that they’ve been planning on re-releasing Earthbound for a long while. I doubt that the reference would’ve been in the script otherwise. CAKETOUCH REFERENCE IN MAMMAL PUNCHING!?!!?!?!?!?! 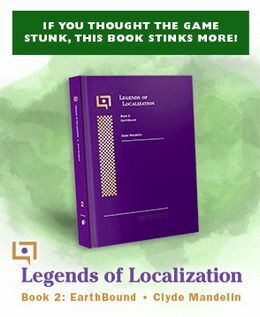 @DelectaBit Not at all, it just means one of the translators is an EarthBound fan. 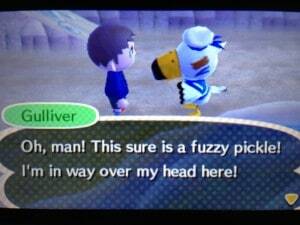 By the way, that Gulliver guy is somewhat reminiscient of Donald Duck. THIS IS NOT AN EARTHBOUND REFERENCE, ITS JUST AN EXPRESSION! @teddyd:there is a photographer in earthbound. go to ness house when onett first becomes sunny. he appears. bam. I’ve never seen the words “fuzzy” and “pickle” used together other than in EarthBound. This is a good step in the right direction. The real question is why didn’t this person use the game’s screenshot function to take a picture..? @Crysta To be frank, I didn’t know it existed at the time of finding him! Now I’m aware of it though. There is one that I know of. At least in the GameCube version, villagers sometimes ask you to retrieve a Pocket Pikachu they lent somebody else. I think it is a reach to call “fuzzy pickle” an Earthbound reference. I recall a number of photographers who have said that phrase to kids when taking their picture. They used it instead of “cheese” to get a laugh out of the kid before they snapped a picture. And yes, it was used before Earthbound came out. When I was a kid, I remember one school photographer saying that to us before snapping a picture. I’m pretty sure that phrase was taken from that for Earthbound, and not the other way around. It is hardly a common expression, but it did briefly become something unexpected for photo taking. Ahh the Fuzzy Pickle expression. As others have mentioned, this wasn’t INVENTED by Earthbound. It is indeed an uncommon expression. However, that doesn’t mean that every use is impossible of being an Earthbound reference. I think in this particular context, with Animal Crossing having other solid connections to the Mother series (at least as I understand; I really know very little about AC), it is safe to call this an Earthbound reference. All we need now is to see Mr Saturn or his crazy coffee! No, seriously, though, the new Animal Crossing is addicting. All of you should play it if you want a relaxation simulator. The music, working on your house, talking to your neighbors; it’s like zen. As soon as Rover referenced the old Animal Crossing, I knew the writers and translators were having fun with this title. 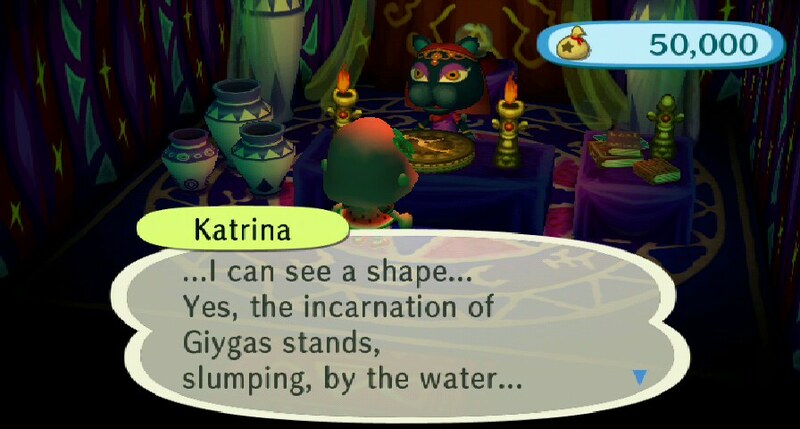 Animal Crossing: City Folk had a Giygas reference! Animal crossing has a lot of cute references here and there of other nintendo franchises in all installments. New leaf just happens to feel more inspired than city folk so people didn’t really point them out back then I guess. Lampi, wasn’t there a feature where you named a constellation and the fortune teller might mention it? the game is full of really good jokes. Has anyone else talked to Sahara yet? That’s one of the better ones. If my memory serves, the older games in the series didn’t really try so hard with these things… Just the “puns” when you caught a fish or insect. I really love the game, by the way. Mato, you still have your 3DS? It’s worth getting for sure. I’m still learning new things about it. It’s absolutely PACKED with new things that you can’t do in older games. The music, graphics and everything else is MUCH better as well. I haven’t been this into a game in years. Come to think of it, you are probably right. New leaf is definitely one of the best titles for the 3DS so far; I put it up there with Fire Emblem: Awakening and Kid Icarus: Uprising. ^ I named my town Onett. Heh, if I had this game I’d name my town Lavender… Yes, I’m evil. Funny how it has an EarthBound reference because if I remember correctly Itoi stated that Animal Crossing is the sequel to the Mother series. @Vukadin I don’t remember him saying that, he said that the series continues as our daily lives. Nope. He said that Animal Crossing is Mother 4. Check your facts. Mr. Itoi needs to lay down on the contradictions. It’s not a contradiction. Quite the opposite entirely. Animal Crossing is a game about daily life! Truth be told, I wish they had added more EarthBound references in Animal Crossing. I’ve always been pretty surprised (and sad) they’ve never thrown in a Mr. Saturn item or something. So far, the only references that I’ve seen are by Gulliver. I’ve played the Animal Crossing games before. I know what they are. But there’s a difference between ‘our daily lives’ and ‘animal crossing, a life simulation game’. K.K. Rockabilly is a remix of the Hippie theme, and I don’t mean it samples it, it literally remixes the song!